Vanilla Chai Pound Cake - Chocolate Chocolate and More! 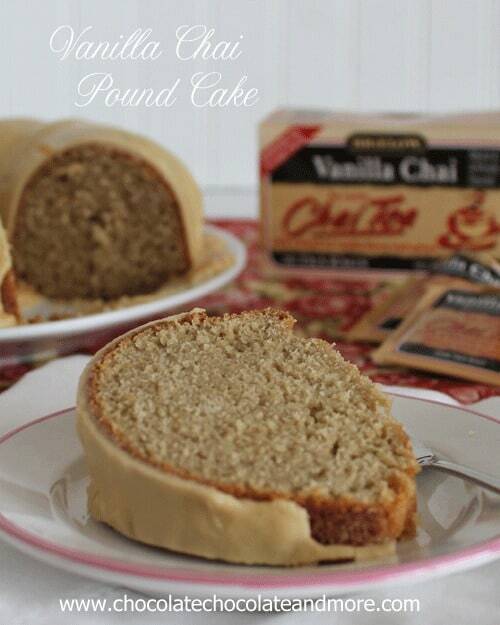 Vanilla Chai pound Cake-A delightful blend of vanilla and spice using Bigelow Tea for a unique flavor. So busy. My youngest and I leave for Washington DC in the morning. Early. I mean really early. We have to be up at the school by 5 am. And today is Valentine’s Day. We’re not big on Valentine’s although I do buy some candy and usually play with some chocolate for dessert. The thing is, while I’ll be with my youngest for 5 days, I’m leaving my older two with hubby at home. I know what they’ll be eating the whole time. Take Out. They’ll have a good time. I’m sure there won’t be a veggie in site. Unless you want to count ketchup on fries as a veggie. I’m ok with that. I little fast food won’t kill them. And when I get home, I’ve got sauce in the freezer ready to take out for dinner. But I want them to remember I’m gone, and miss me, just a little. 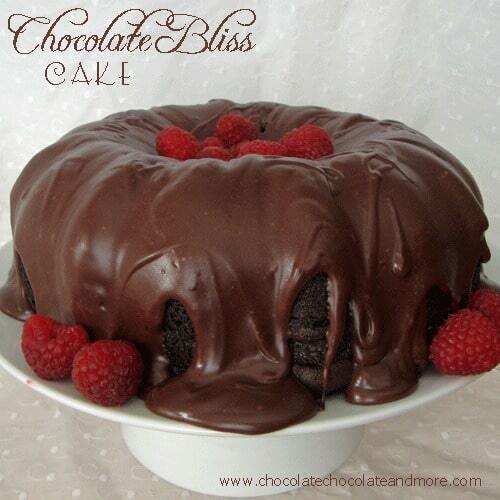 Chef Dennis reminded me of Bill Cosby’s skit “Chocolate Cake for Breakfast.” I love Bill Cosby. Probably the only comedian who kept his act completely free of cussing and still had you laughing till your sides hurt. Cake for breakfast. There’s something to this. If they’re going to be eating junk all weekend anyway. I could probably justify cake the same way Bill Cosby did. Eggs, flour, tea. Yup. Breakfast food! 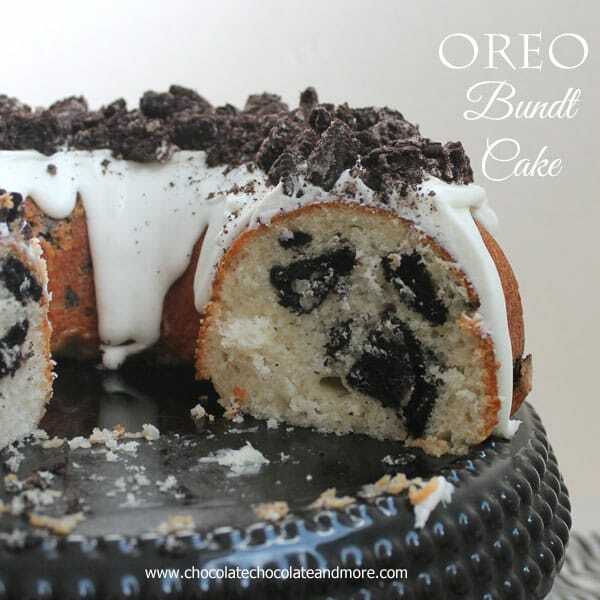 Not only does this cake qualify as breakfast food but also aroma therapy. The minute you open the tea bags, the vanilla and spice assaults your senses. The foil pouches keep the tea so fresh. I could have sniffed those tea bags all day. But it gets better, as you steep the tea in the milk and then again for the glaze, I felt like I was in an old Calgon commercial. It’s that amazing. I have to tell you this cake is fantastic. 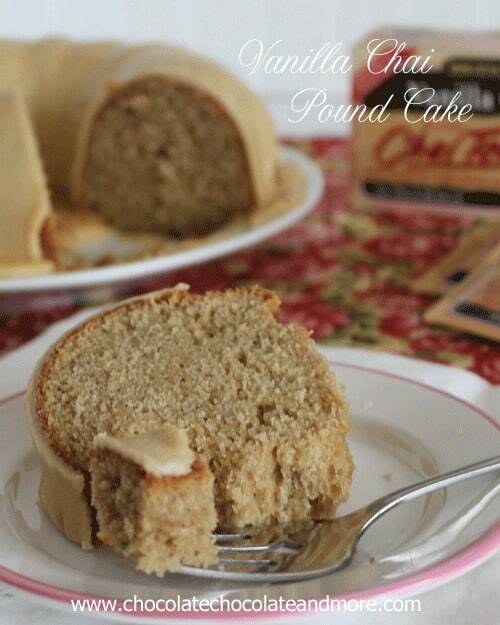 The flavor is a cross between a vanilla pound cake and a spice pound cake. I knew the cake would be good, I tasted the batter. In fact, I was the one to lick the bowl clean, something I haven’t done in years. 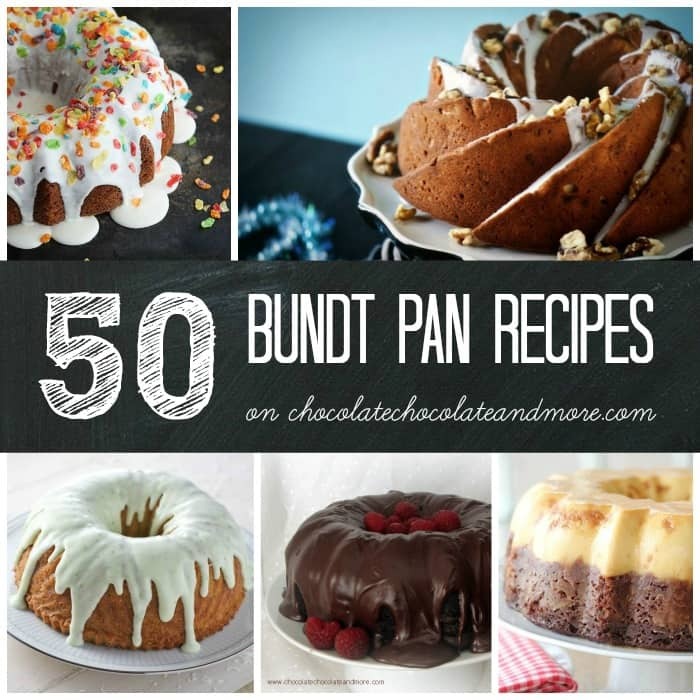 The glaze makes more than you’ll probably want to use but it’s ok. Just grab a spoon, or if you want to be a really cool Mom, save it for the kids. It reminded me of the old fashioned Maple Candy my Grandma used to make, only not maple flavored. The original recipe used Bigelow Vanilla Caramel Tea. I was disappointed my Walmart didn’t carry it. After having a slice of this cake, I’m almost glad they didn’t have it. I still want to try this recipe with the Vanilla Caramel so I’ll check the other Walmarts in my area. We have 5. Using the Vanilla Chai was an amazing substitution and I’m so glad I decided to try it. Heat milk in a heatproof bowl or measuring cup to almost boiling in microwave (took about 90 seconds in mine) Add tea bags and let tea steep for 6 minutes. Strain and set aside to cool. In mixing bowl, cream butter until fluffy. Add in sugar and mix well. Add eggs, one at a time, making sure to completely incorporate. Fold in flour and tea infused milk. Just till combined. Pour batter into prepared pan. Bake in a 350 degree oven for 45-55 minutes until golden on top and a toothpick inserted comes out clean. Let cool in pan before inverting onto serving plate. For the glaze, steep tea bags in boiling water for 6 minutes, Strain, In large bowl whisk tea into powdered sugar until smooth and creamy, drizzle over cooled cake. Check out my shopping trip to Walmart for Bigelow Tea. I am a member of the Collective Bias® Social Fabric® Community. This shop has been compensated as part of a social shopper insights study forCollective Bias® and Bigelow Tea #CBias #SocialFabric #AmericasTea All Opinions are my own. Sound delicious Joan! Have a great trip in DC! This sounds great – you are already at the school and on your way to DC. have a lovely time – and when you get back, could you tell me please, what Chai tastes like? I would love to try this but I’ve never tasted Chai and wonder what it tastes like. Take Care!! The people of India boil their tea with spices like cardamom, star anise, allspice, cloves and cinnamon. The word chai to them simply means tea, because that’s just how they make it. I was shocked the first time I saw my friend Masuma make chai. She put water into a pot – one you would use to boil pasta – and threw in several bags of a black tea. I thought, surely she didn’t mean to boil the tea! How very un-British! Well she did, with the assortment of spices I listed above. After boiling until the tea was good and strong and the spices had infused their essence, she added whole milk and sweetened it with sugar. She ladled it out of the pot, into a tea cup and after waiting for it to cool, I took my first sip. It was delightful. I love the heady fragrance that greeted me when I lifted the cup to drink. The milk and sugar rounded out any bitterness of the black tea and the spices…well, they turned a cup of tea into an exotic treat. The commercial version of this tea are fine. They allow you to make enough for one or two cups of tea. Masuma would always make a big pot of tea for the entire family. 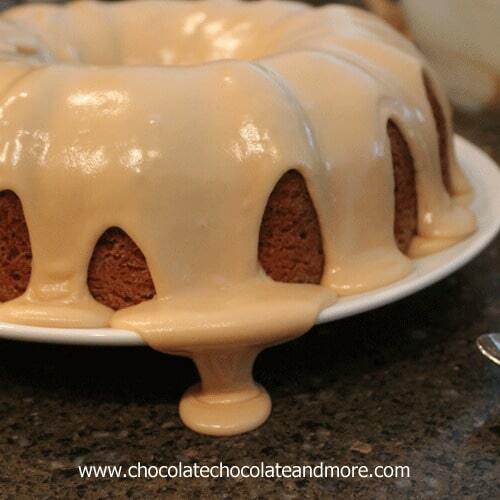 I wish I were there to grab that glaze dripping down the side! Yum! THIS is my kind of breakfast! 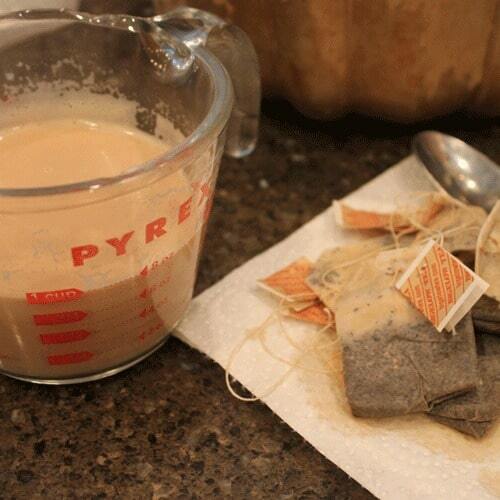 Oh my gosh, I love chai tea! This looks pretty awesome Joan! There is nothing like mom going away for a few days to create some family appreciation. It doesn’t take long before you’re taken for granted again but it sure is fun while it lasts 🙂 This looks like a wonderful flavor blend. Warm and cozy. I can’t wait to try it. Thanks! 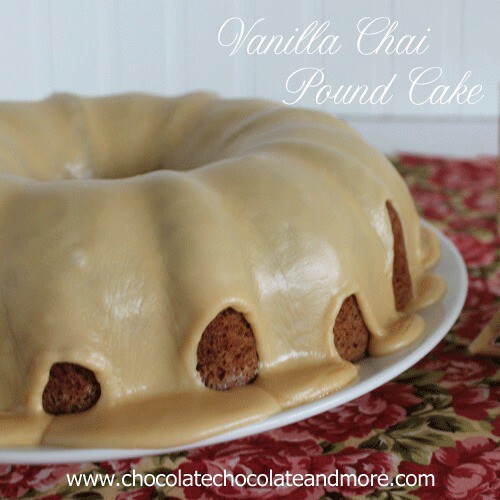 mmmmmm looks divine …i’m going to have to make this, I love chai! I am in love with that chai tea too! That cake with all the glaze on it looks so delicious!!! 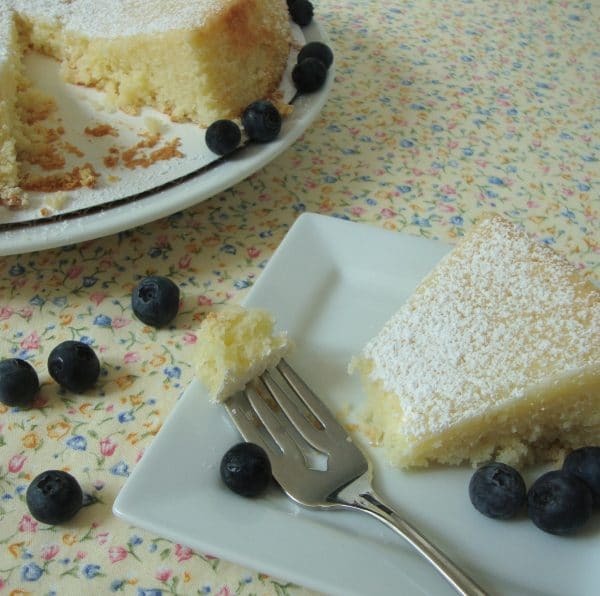 Beautiful cake, Joan…I can just imagine that wonderful Vanilla Chai scent as I was reading your post. I’m a Chai Tea lover!!! Al kinds of Chai. I can’t wait to try this cake. I might even make it into cupcakes. Thank you so much for the recipe. Hi!!! I need help. On the instructions says to add cream but it is not on the ingredients list. You’re referring to where it says to add sugar and cream. I’ll clarify in the recipe, that’s cream the mixture again with your mixer.